This tour offers a lifetime journey with nature and the outback. If you are a fan of the movie Crocodile Dundee or you like Steve Irwin (Crocodile Hunter) adventures, you will love this tour. Places you will visit on this tour are: Uluru - Ayers Rock, Kings Canyon, Wadlata Outback Centre, Alice Springs Desert Park, Simpsons Gap, Karlu Karlu - Devils Marbles, Flinders Ranges National Park, and many more attractions. To book this tour or to customized to your needs call us at: 1-800-842-6943, or email us at: mytravel@platinumholidays.com. Arrival in Sydney. International flights from most major cities. Visit today: Historic Hay, New South Wales located on the banks of the Murrumbidgee River in a flat salt bush plain between Sydney and Adelaide. 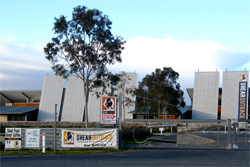 Enjoy the museums including Shear Outback, the Australian Shearers Hall of Fame, parks, gardens and recreation. Take time to visit the 180 degree sky before the night is over. Overnight in Hay. Includes Dinner. 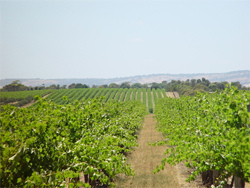 Today you will see: The scenic wine and olive growing region of McLaren Vale, a small country town, only 40 minutes from Adelaide, a great place to enjoy food, wine and culture. Overnight in Mclaren Vale. Breakfast and dinner included. Today's tour: A guided tour of Adelaide Central Market, the largest fresh produce market in the Southern Hemisphere. Take time to visit one of the trendy cafes. Overnight in Adelaide. Breakfast included. Visit today: Enjoy the sights of Adelaide and then head north to Sevenhill Cellars, the oldest operating winery in Clare Valley. 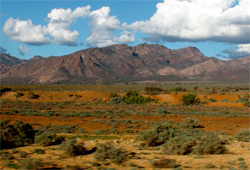 Flinders Ranges, are the highest mountains in Southern Australia. 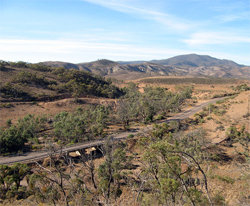 Wilpena Pound, is an enormous natural amphitheatre located in Flinders Ranges National Park. Overnight at Wilpena Pound. Breakfast and dinner included. Today's highlights: Time to explore Wilpena Pound and then travel through the Pichi Richi Pass to Port Augusta. Wadlata Outback Centre in Port Augusta gives an introduction to life in the Australian outback. Overnight in Port Augusta. Breakfast and dinner included. Today's visits: Woomera owned and operated by the Australian Department of Defense to see the aerospace sites and museum and the Woomera Marine Centre to see the desert flora and fauna and then on to Coober Pedy, the Opal capital, to see an underground church and home. Overnight in Coober Pedy. Breakfast and dinner included. 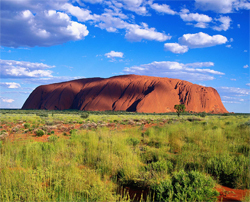 Today you visit: Uluru - Kata Tjuta National Park (Ayers Rock). Australia's most recognizable natural icon, declared a World Heritage UNESCO natural property. Enjoy the different shades and hues at sunset that Uluru is famous for. Overnight in Uluru. Breakfast included. Today's Highlights: Take a walk to see Uluru at sunrise and take a guided tour to Mutitjulu Waterhole, a necessary source of water for the aboriginal people and animals in the area. Visit Kata Tjuta Cultural Centre established by cooperation between the Anangu people, the traditional owners and Parks Australia and learn about the cultural and spiritual significance of Uluru to the Anangu people. Walk to the Walpa Gorge. Today you will visit: Kings Canyon. In the Northern Territory, known for its red limestone walls up to 300 metres high. 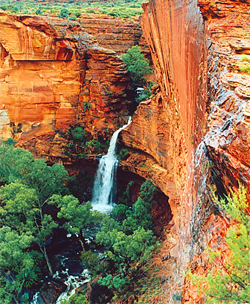 You choose between a demanding but very rewarding climb to the rim of the canyon to enjoy the view of Watarrka National Park or the Kings Creek walk to explore the traces of the gorge at the canyon bottom. Overnight in Kings Canyon Breakfast, dinner included. Today you visit: Alice Springs, the heart of Australia halfway between Darwin and Adelaide on the southern rim of the Northern Territory where you can see the Royal Flying Doctor Service, The School of the Air and the historic Telegraph Station. Overnight in Alice Springs. Breakfast included. 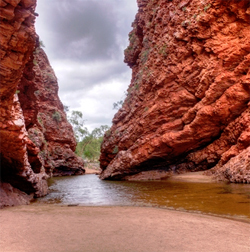 Today's tour: With an Aboriginal guide you will learn about the survival skills of the Arrente people and later visit Alice Springs Desert Park to learn about Australia's unique desert wildlife and on to Simpsons Gap a well known watering hole lined with red-gum trees. Dine at a Ooraminna, a genuine outback homestead. Overnight in Alice Springs. Breakfast, Dinner included. 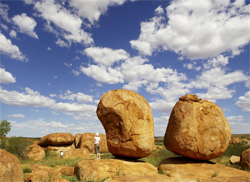 You will visit: Karlu Karlu(devils marbles) Walk around these wondrously formed and positioned boulders. Tennant Creek the centre of the sprawling Barkley Tablelands, covered in black soil and a sea of golden Mitchell grass. Visit the Battery Hill Precinct to see the past prosperity of the 1930's gold rush. Dine at the Battery Hill Mine. Overnight in Tennant Creek. Breakfast and Dinner included. Today you will visit: Daly Waters Hotel A historic site for refreshing cattle, drovers, airplane passengers and recently tourists, the first international airport in Australia prior to World War II. 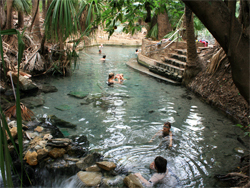 Mataranka Thermal Springs Relax in the warm, refreshing thermal pool lined with large palm trees. The sandy bottomed lagoon is a welcome break for travellers enroute between Adelaide and Darwin. Overnight in Katherine. Breakfast and dinner included. Today's highlights: Katherine Gorge Take a morning cruise on the beautiful Katherine Gorge in Nitmiluk National Park and into Kakadu National Park. Yellow Water Billabong another cruise later to see the varied bird life and possibly a crocodile basking on the river bank. Overnight in Jabiru. Breakfast and dinner included. Today's highlights: Bowalli Visitor Centre an interpretative centre to appreciate the varied habitats and landscapes of Kakadu. Ubirr climb up to one of the rocky outcrops on the edge of the flood plains of Nadab and view the rock paintings up to 2000 years old near the base. 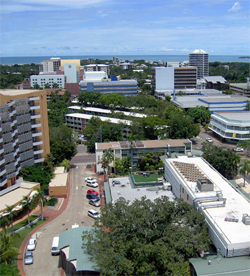 Darwin Australia's Northern Territory's largest City. Take a city tour and enjoy the sites in one of Australia's most modern cities, most of it being rebuilt after World War II. Overnight in Darwin. Breakfast included. 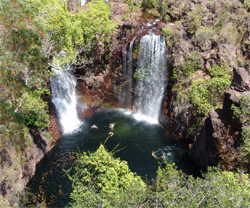 Today's tour: Popular year round Florence Falls and the interesting Magnetic Termite Mounds in Litchfield National Park. Crocosaurus Cove Theme Park, a place to get up close and personal with a saltwater crocodile, the world's largest display of Australian reptiles as well as local Aboriginal art and culture. Overnight in Darwin. Breakfast and highlight dinner included. Conclusion of the tour. Transfer to Darwin Airport to connect with your onward flight. Breakfast included. Platinumholidays.com specializes in cheap Australia Tours and affordable Australia Holidays. We offer tours for 18 days to the Australia Outback, and tours that will also go to New Zealand. Our packages have tours to Sydney, Cairns, Hay, New South Wales, Mclaren Vale, Adelaide, Uluru, Alice Springs, and Darwin. You will also visit famous attractions such as Ayers Rock, Kings Canyon, Simpsons Gap, Karlu Karlu (Devils Marbles), Florence Falls, and many other attractions. Any type of tours to Australia we have it, this tours can be customized to meet your needs and they have connecting flights available from major cities in Canada. Plus our tours have Private Expert Guides and air conditioned vehicles.